Those 14 may think it perfectly proper to have in-house review, though I doubt that they were asked, but the many individuals who were denied a review may think that an element of bias entered the process. After all, marking your own homework has never been the most robust means of ensuring an impartial decision. 14 upholds from 217 reviews gives a miserly 6.4% uphold rate, but in fact it is a lot worse than that as many more review requests just disappeared from the figures discussed by Dame Julie Mellor and were not listed in the Annual Report. 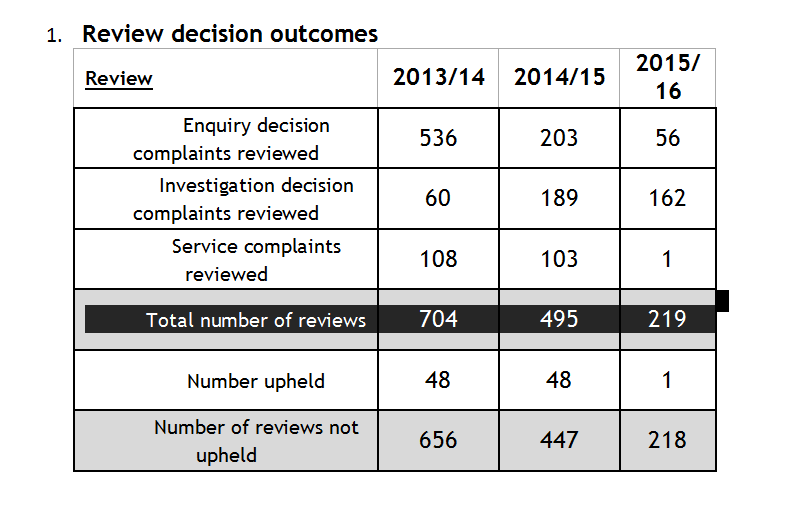 The truth is that 1,969 people requested a review last year which is 164 a month or 37 per week, but the majority of these failed to meet the criteria for review. From the total number of review requests, the uphold of just 14 now gives a 0.7% chance of overturning a decision at review. Hardly worth the effort of going through all the paperwork, providing again the evidence which had been ignored and completing a detailed, point by point response. We overlooked or misunderstood parts of the complaint or did not take account of the relevant information, which could change our decision. And as for making a service complaint about PHSO themselves clearly the award winning Customer Care Team have those totally under control as you can see in the table below. The fortunate 0.7 % may consider that allowing PHSO to review their own complaint handling is ‘perfectly proper’ but the other 99.3% may be of a different opinion. Previous Previous post: Ombudsman to public bodies: “Please do as I say, pretty please, I’ll be your friend”. Next Next post: Will HSIB be patient centred? This is so true…I am disabled and 68, not good at writing or explaining myself…Have been fighting for HA repairs for over 5 years, not told about Housing Ombudsman til November 2015, went through all the official tiers and Senior management review, after 7 months Ombudsman said my complaint had been exhausted on June 3rd 2016 and they would be able to take on my complaint on 29.7/16 for early resolution…When I contacted Ombudsman in August because HA were ignoring me and my complaint, putting solicitors letters threatening my tenancy, I found out the Ombudsman had left the service, since then it has gone from bad to worse, I have had no reason or support from Ombudsman, I am so deeply upset… HA are just making my home, life and health unbearable. I have so many Major repairs that are now worse because of the bad repairs they have done and the time it is STILL taking, I am being bullied and can’t fight them anymore. Hit the nail on the head with comment about the PHSO marking their own home work. Would not pay the PHSO Investigator’s in brass washers! In my case, the external reviewer overturned the review. This was because the ‘review’ team hadn’t bothered to turn to the page next to my MP’s letter and so missed the words’ public interest’. It didn’t matter how many times I told the head of review that the words existed ….and they were what she should be pinning her review on – she ignored and sent me the usual stream of P!ss Off letters. It was such a bad botch up of a review that the PHSO awarded me £500. But a lot depends on how you argue Your case external reviewer. 2. Don’t trust them – as my reviewer stated he reported to Dame Julie Mellor -and no one else. Nb Surprise! External reviewers are contracted through the head of legal. Dont know if they still are. For anyone unhappy at their review- there are some points from the external reviewer’s judgement which can be used to support cases presented for review. Here’s what happened in the 579 days for the PHSO to find out it hadn’t bothered to read or understand my complaint. 1. Complaint that the ICO should consider that private companies..who depend on lucrative contracts – should’t be secretly advising the NHS not to provide legally due medical notes to the bereaved. Its in their financial interest to stop the bereaved – to keep their contracts, therefore public interest should override their ability to act in complete secrecy due to the Data Protection Act, which allows the companies to break the law, by witholding medical notes, which the bereaved might never know exist. In my view, one law shouldn’t protect the breaking of another. The PHSO couldn’t understand the concept… and ignored the public interest determination. It’s a flimsy argument – owing to the strength of the DPA – but it’s clearly wrong that the bereaved are treated this way by the NHS. And therefore worth trying to change. She signed off the complaint as ‘Case closed’. Anne Harding, lawyer, who wouldn’t accept my complaint at all, as she didn’t have anything to do with complainants. Fault: The external,advisor stated othat as soon as she got involved ..everything went well. In fact she wouldn’t communicate with me at all. Nb AH was in charge of employing external reviewers on temporary contracts. Sarah Fox, Ombudsman’s office, who simply wouldn’t listen to my reasoning of why the complaint had been misunderstood ..as I tried to explain the concept to her. If she had , it might have saved me around a year’s work to try and get the complaint investigated. Fault: She rang me to tell me that she didn’t know about my case. Logically I thought she wanted me to explain it. Silly me. I tried to tell her but she was so arrogant she failed to listen to what I was saying about the case. Of course, she was judged right to do so by the external Investigator. The PHSO will protect itself by stating the employee is blameless. The FOIA department withheld the crucial internal evidence in my favour. It was ONLY because I asked myself ‘what’s missing ‘, and could I state that a sign off on the review logically must exist, that they had to hand it over. Once I’d managed to get this withheld document – tyev Beazley review verdict- it was plain she had fallen well short of conducting a proper review. Fault: Check SAR ‘s with a gimlet eye. My opinion is that it is NOT a mistake that crucial points in complainants favour are witheld. As it’s happened TWICE to me. My case had depended on it because it showed how badly she had botched it up. 1. The FOIA team apologised for mistakenly witholding the crucial Decision document. Nb This was also upheld against the PHSO in my favour …..as the mistakenly ‘ forgotten’ documents helped me prove my case in court. Once again…good job I’d recognised the fact that documents were missing. Undertaken by John Halliday, external investigator, he understood the concept straight away. He has the intelligence diligence and integrity to investigate complaints. Which, at last, was something of a relief. ‘ It is also clear that a substantial avoidable delay resulted. I can it say what the result would have been if one had been launched in November 2012, as it should have been, but whatever it’s outcome a good deal of delay would have been avoided…..
‘…It is not evident from the papers that I have seen that the PHSO has a robust system to dealing quickly where complaints are made about the review team itself. The key to presenting your complaint is to understand the PHSO review process and match your complaint to the parts of the process that the caseworker has not followed or misunderstood. 1b The review makes no mention of public interest. Because it’s much harder to deny points if they are matched up in this way, rather than one long explanation. Some of the questions you have raised fall to be answered under the FOIA. I will set these out below. 1.Was it policy in autumn 2013 to “share draft reports with all parties”? In autumn 2013, we had the ‘interim’ guidance for the ‘More investigations for more people’ investigative process. To answer your question directly – yes, it was PHSO policy to share reports with the complainant and public sector organisation in autumn 2013. 2.Was it policy in autumn 2013 for “evidence material to the decision can be released at this point”? If a complainant requested copies of the evidence material to a report produced in 2013, that request should have been considered and responded to. This is actually good news – it is the evidence for the need for reform that we’re pressing for! I’d just like to say that the overturning of a decision does not mean that the person requesting a review got the outcome they wanted. The figure of 0.7 per cent is made up of two categories, upheld complaints and partly upheld ones. Some complainants in the 0.7 per cent category might consider the outcome of their review request worthless – something minor such as a single delay could have changed the decision from a not upheld to a partly upheld. I note what J Roberts says here – I had apology for the undue delays but it did not overturn the Decision which stayed unchanged. The numbers speak for themselves. Corrupt system that keeps overpaid people in ‘non jobs’. Nice work if you can get it when that well paid work comes with a guarantee that you will be protected no matter what harm you do in the process. Personally I wouldn’t be able to sleep soundly. The processes to access the PHSO also need scrutiny – the Adjudicator’s Office for those coming from the HMRC (tax) and valuation offices, and that we have to come via our MP. The adjudicator has no appeal and no comeback; she has wide powers but does not use them for the people’s benefit. In my experience, the AO take as long as the PHSO and are as bad in terms of poor communications, sidestepping making any real redress, and feeling distant and uncaring. Their compensation is a fraction of what’s deserved and are admittedly a token gesture. The other issue is the compulsory use of our member of parliament to apply to the PHSO, who if unsympathetic and inefficient, can scupper our case, as mine did – forgetting to send the substantial document so that my case was assessed with most of the papers missing. He refused to resend when PHSO asked me, and was slow and uncaring beyond belief, and seemingly not accountable. I wonder if others have had issues with these and I’m especially interested to hear about MPs blocking the path to the PHSO.